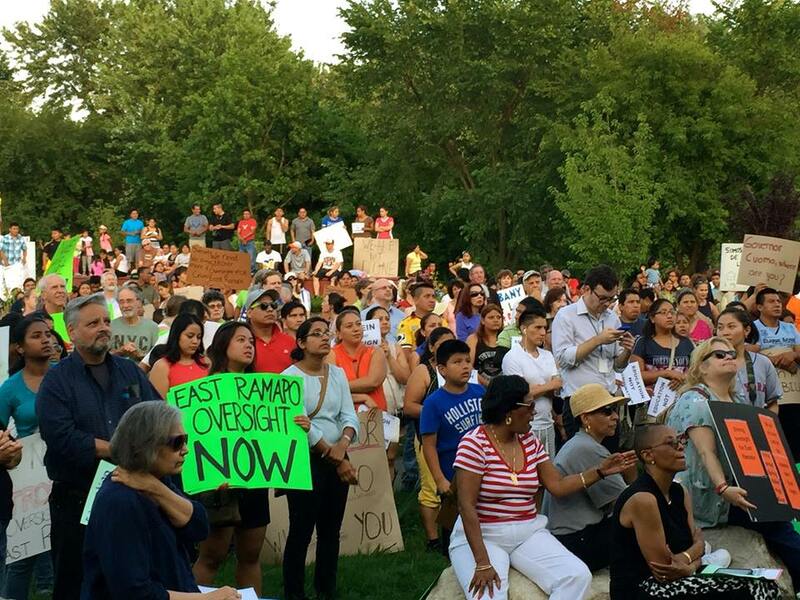 Is protesting the East Ramapo School Board a Jewish cause? Andrew Mandel jokes that he grew up attending the “Cadillac schools” of the East Ramapo Central School District. By that, he means Fleetwood and El Dorado elementary schools — two institutions that either by happenstance or design bear the names signature vehicles produced by the car maker once solidly branded with upper class excellence. If you drove a Cadillac when I was growing up, you had arrived. But in some ways, there’s another layer of meaning under this. That these schools bore more than the Cadillac names, but some essence of that upwardly mobile excellence associated with them. He means schools that were rich in diversity and in offerings. Schools where you could get a world class education. Schools that enabled him to excel enough to get a scholarship so that he could attend a private school and then Harvard University. Schools that clearly once worked well for the students who attended. 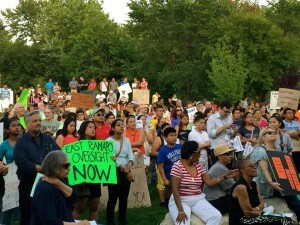 The East Ramapo schools today are not working well for the students who attend them. A nine-member school board, seven of whom are haredi Jews, has by all appearances disregarded its mission to serve the students of the district. There are more than 33,000 school age children in the district, and at least 24,000 of them attend private schools — mostly yeshivas. Growth in special education services, much of it for students outside the public schools, and transportation for those yeshiva students dominate the school budget. Draconian cuts to services for the 9,000 students comprising the public school population — 91 percent African-American, Latino and Haitian; 78 percent qualifying for reduced and free lunches — have left them with little but the most bare-boned educational program, while services to private school students increased. And the board lacks a fundamental reckoning of the meaning of open meetings with transparent proceedings. Mandel was already aware of what was going on in the East Ramapo schools. His parents still live here. But he became in the cause after hearing a story on This American Life, the NPR radio program, profiling the East Ramapo School District. Alarmed by the situation he tracked down one of the students profiled on the radio program, who in turn sent him to Oscar Cohen at the local NAACP. Cohen and others welcomed his support. As momentum grew last year, organizers were able to galvanize wider support, including that from the Rockland Board of Rabbis, comprising the Conservative and Reform clergy of the county, and Uri L’Tzedek, a Modern Orthodox organization in New York. Then in late 2014, state fiscal monitor Hank M. Greenberg released a report highly critical of the school board. This served as a catalyst for community organizers, and a rallying cry for the community, who have often lacked this kind of concrete, institutional support. State Assembly members Kenneth Zebrowski, Jr. and Ellen Jaffe introduced a bill that would have given an independent monitor oversight of the school board with veto power. With the help of pavement pounding in the community and on social media, visits to Albany and an incredible number of phone calls to legislators, the bill passing handily in the Assembly. Yet John Flanagan, the temporary president of the state senate and majority leader, never allowed the bill to come to the floor. But today Mandel is cautiously hopeful. Since then, other reports, including one from the New York State Board of Regents, have only served to bolster the findings in the Greenberg report. The school board has since — perhaps wary that now the eyes of much of the state are upon them ­— fired its law firm. And calls to get rid of East Ramapo School Superintendent Joel Klein, whose lack of “cultural” understanding of the families in East Ramapo came under fire, have escalated with protests in front of his home. Mandel has reason to believe they might be heeded. What grounds all this is his fundamental belief that a child in the East Ramapo Schools today should have the opportunity to receive the same quality of education that he did growing up in 1980s. Mandel speaks of what he knows. After graduating from Harvard, he went to work for Teach for America. He worked for two years in Raymondville, Texas, a little more than an hour from the Mexican border. His students were low-income, with poor English skills, and light years behind. to insist on a public school advocate to fill the seat recently vacated by Juan Pablo Ramirez. The organization is holding a planning meeting on Sunday, Aug. 9 at 4 p.m.to launch for the 2015-2016 legislative session , to begin strategizing. To attend, email Mandel to get location information. Organizers realize that going forward, the legislators far from Rockland hold more power than they initially realized, and they will need to work on them to gain their support. The East Ramapo school board members often accuse their detractors of anti-Semitism. While I do not believe that anti-Semitism is at the root of what’s going on, their critics have often done a very poor job keeping bigotry from the very heated debate. So I asked Mandel his response as a Jew. Not just any Jew, but a committed one who still attends synagogue and sees his calling as stemming from a profound sense of social justice born of his understanding of Judaism. His answer was very Jewish. He told me a story. Early in his involvement with the East Ramapo issues, he attended a school board meeting with his mother. During the meeting, one parent got up to the microphone and began in Spanish asking how many people there worked for the Jews. He then ranted about what “they” (the Jews) do to them. Early in his involvement with the East Ramapo issues, he attended a school board meeting with his mother. During the meeting, one parent got up to the microphone and began in Spanish asking how many people there worked for the Jews. He then shouted into the microphone about what “they” (the Jews) do to them. Mandel’s mother asked what the man was saying, and as he translated, her eyes widened with worry. It wasn’t the sort of thing that you want your Jewish mother — especially the one who helped instill that sense of justice in you — to hear. Since then that man has spoken with him, still a little incredulous that Jews would be supportive. He has posted on Facebook comments appreciative of the Rockland Board of Rabbis involvement. Andrew Mandel is willing to step over that line again and again. Because every child deserves what he got — a Cadillac education.